It’s a question we get asked a lot: What is the difference between BillionGraves and Find A Grave? First of all, there are many similarities between BillionGraves and Find A Grave, but it’s what we do differently that really sets BillionGraves apart. To better explain, we decided to write two posts. This blog post is the first of a two-part series. 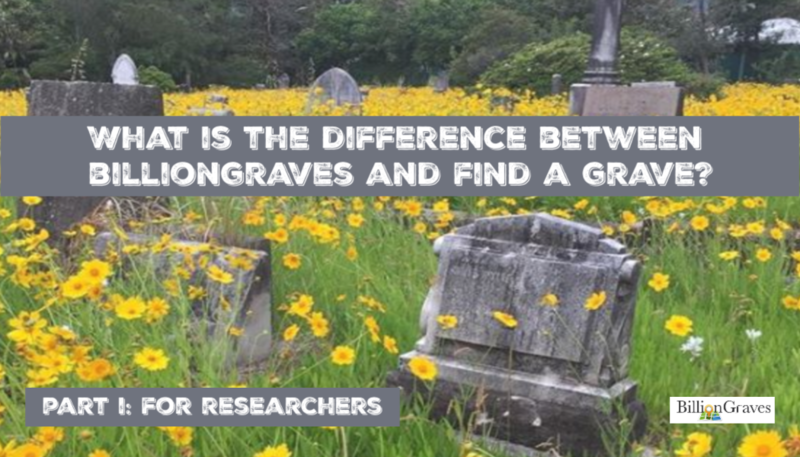 It focuses on how the differences between BillionGraves and Find A Grave impact research for genealogists. The second post will focus on how the differences impact volunteers who take photos and transcribe data. Who are BillionGraves and Find A Grave? As a researcher, it is important to understand who BillionGraves and Find a Grave are. 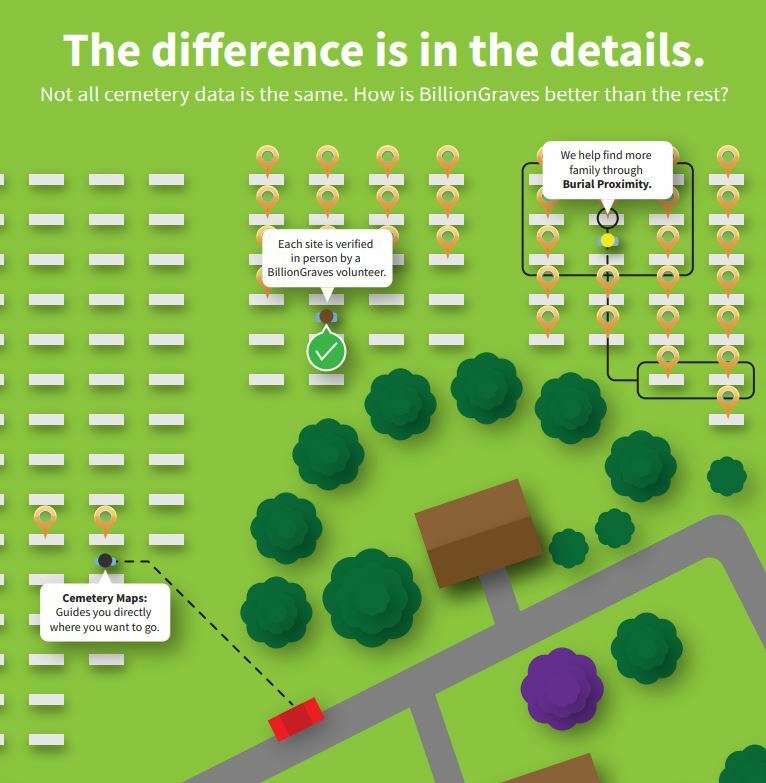 Find A Grave and BillionGraves are similar in that both websites have cemetery data. The primary difference between the two companies is that with BillionGraves, EVERY record you will find a photo and a GPS location. 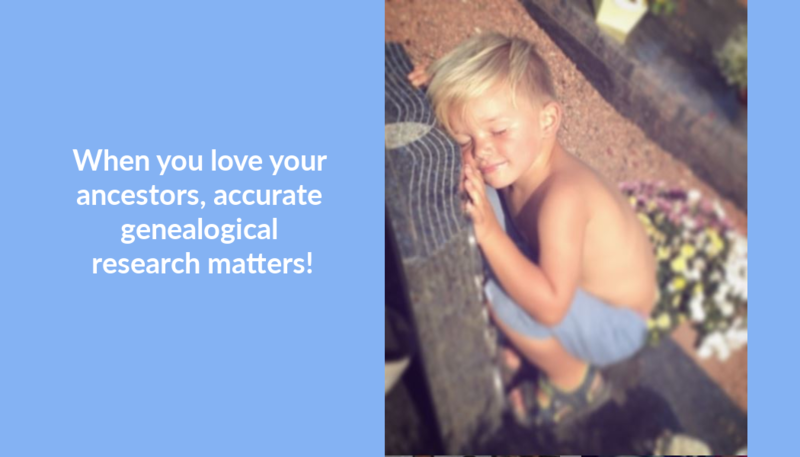 And why should this matter to you as a genealogical researcher? 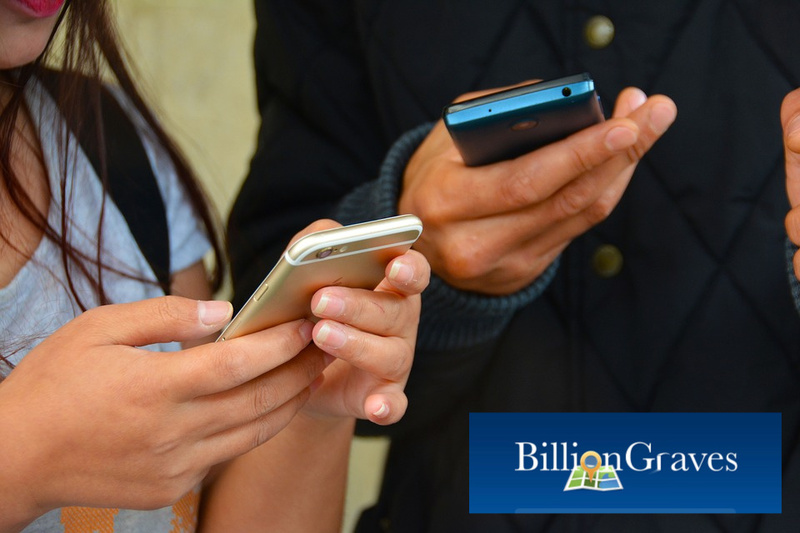 Because by gathering an image and a GPS-location for every headstone, BillionGrave is following the Genealogical Proof Standard. Do BillionGraves and Find A Grave both follow The Genealogical Proof Standard? Based on the definition above, no. Only BillionGraves follows The Genealogical Proof Standard. Find A Grave’s stated objective is to create memorials. It was not started as a genealogical site, so it makes sense that how they acquire data does not put emphasis on following the Genealogical Proof Standard. BillionGraves, however, is an open source database that is EVIDENCE FIRST. Meaning, BillionGraves records start with a gravestone image and then that image can be connected to a person on a family tree – not the other way around. Why is it important to have an actual photo of the gravestone? A photo of the gravestone allows researchers to verify that the information on the stone has been accurately transcribed and attributed to the correct person. Find A Grave users establish memorials by entering information they have gathered about the deceased. Though the name “Find A Grave” has the word “grave” in it, the memorials on the site often do not have a photo of a gravestone. 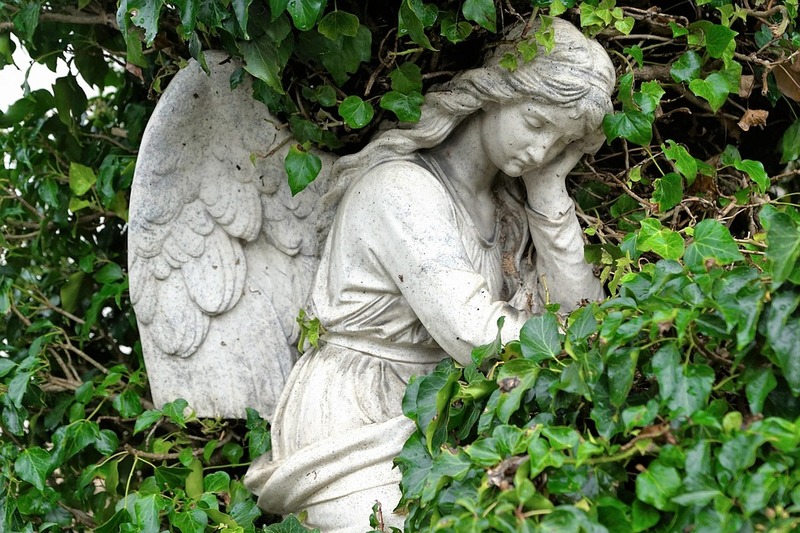 Why is it important to have a GPS location of the grave? Finding a particular gravestone at a large cemetery using Find A Grave can be like searching for a needle in a haystack. GPS locations are not marked on a map. So gravestones must be located by walking until the right one is spotted. Above is a Find A Grave map of a cemetery in Hamilton, Indiana. The Find A Grave website claims this cemetery is 86% photographed. However, there are no markers on the map to show which graves are done. 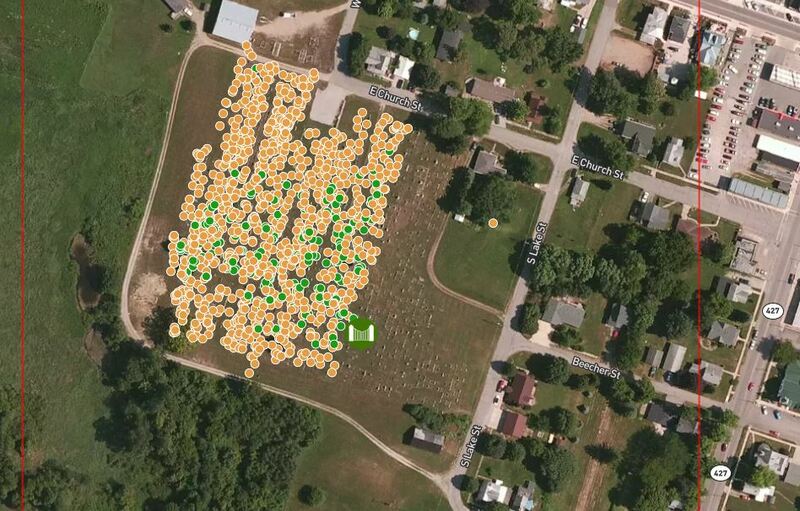 This is a BillionGraves map of the same cemetery in Hamilton, Indiana. The dots represent photos and GPS locations for each gravestone. The gravestones that are visible on the right side of the map have not yet been photographed. Is it easier to find an ancestor’s gravestone when at a cemetery with BillionGraves or Find A Grave? I talked with a couple that tried to find an ancestor’s final resting place in a cemetery with nearly 30,000 gravestones. They knew the ancestor was buried there because the grave was posted on Find A Grave. But they spent four hours in the hot summer sun searching up and down the rows to find it. Then enter your ancestor’s information. Usually, just the name is enough to find it, but you can enter birth and death years if you like. Click “Search.” A page opens with information about the individual. 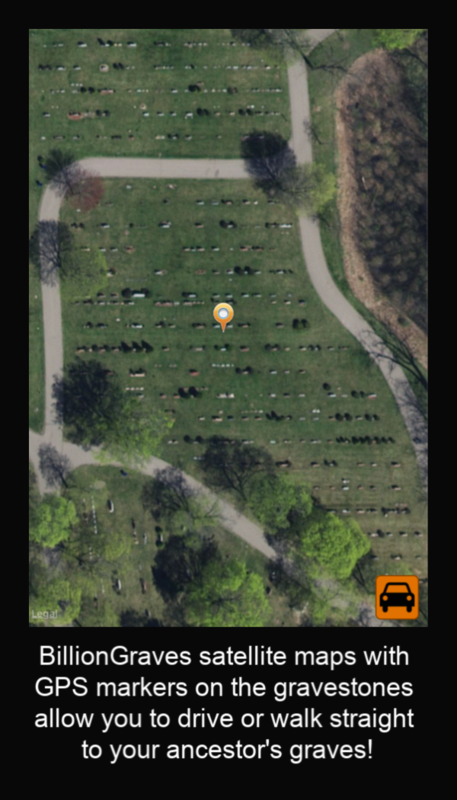 A satellite map of the cemetery opens with a GPS marker tagging your ancestor’s gravestone! As you can see from this map as we zoom out, it would have taken a long time to search this cemetery to find this particular gravestone if you did not have a GPS marker! When I showed the couple how simple it was to find gravestones with the BillionGraves app they said, “Oh, if we had only known! 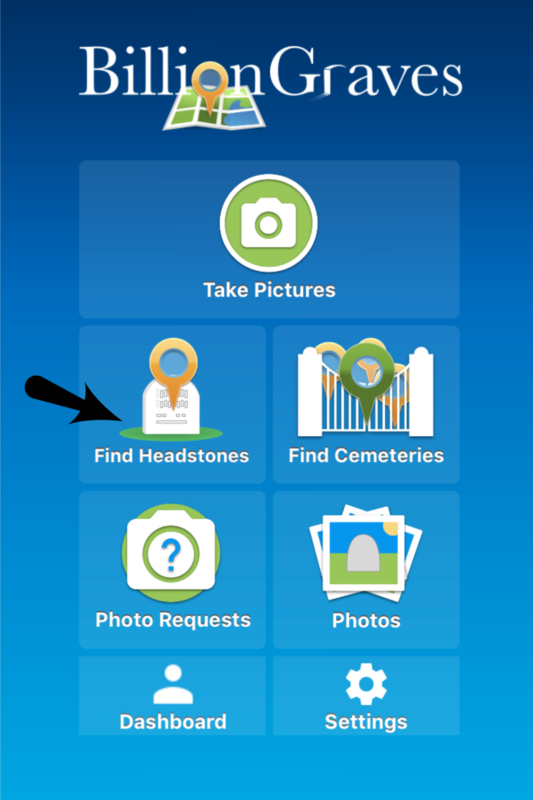 It would have saved us so much time!” Within minutes of arriving at the cemetery, you can be standing in front of your ancestor’s grave by using the BillionGraves app! How can I find unknown relatives with BillionGraves or Find A Grave? 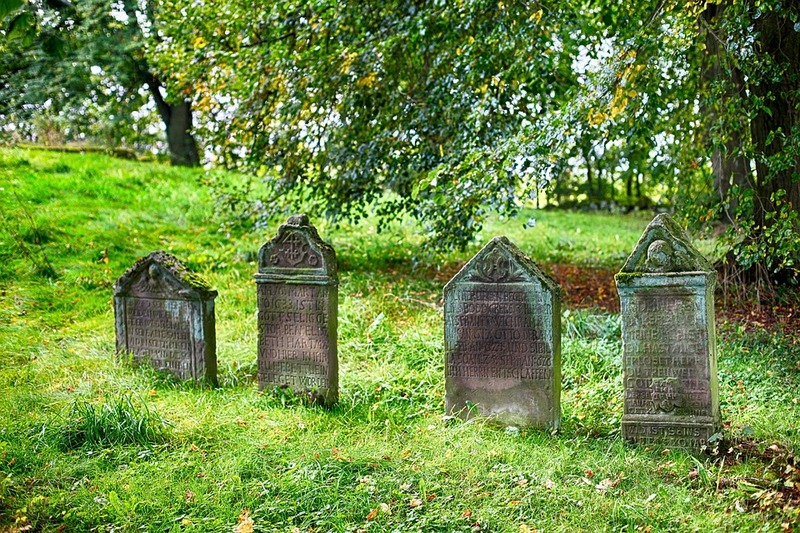 Did you know that 70% of people are buried in family plots? 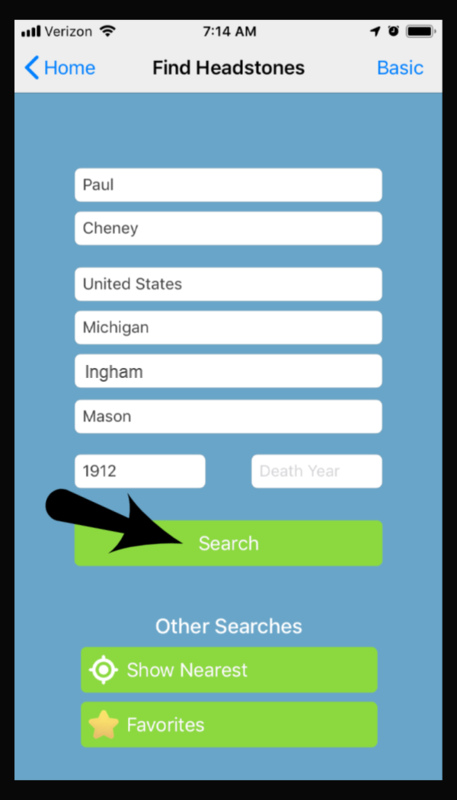 The BillionGraves Plus Nearby Graves feature allows you to search the cemetery to see who is buried in close proximity to your ancestor. Those in close proximity to each other usually indicate familial relationships. So when you find your ancestors on a BillionGraves’ record you may also find cousins. You may find sisters with different last names due to marriage. 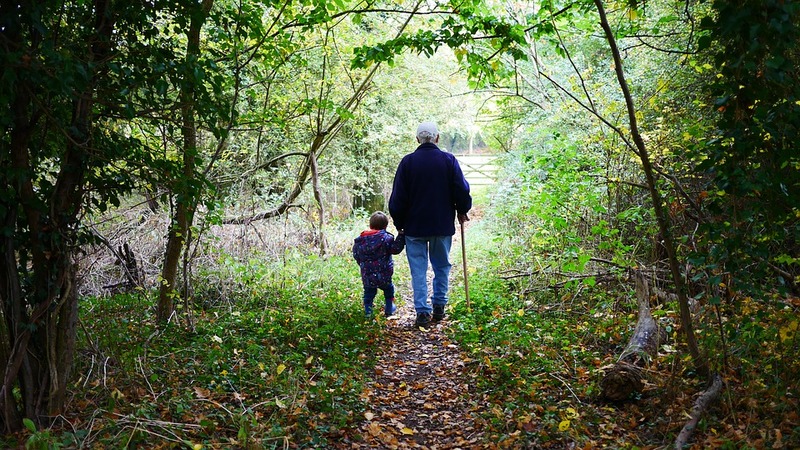 Your search may even reveal grandparents buried near babies that were, in fact, their grandchildren with different last names. 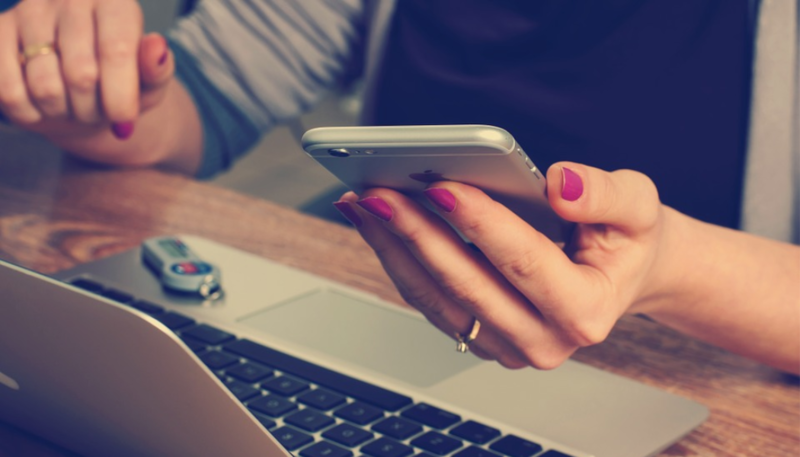 You can then use the connections you found with the GPS-linking to do further genealogical research to locate additional sourced-documentation. Take Thomas Jefferson for example . . . 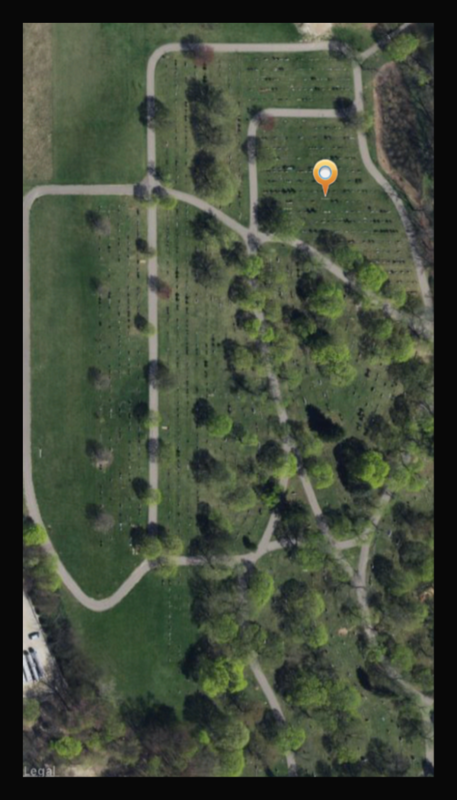 This BillionGraves blog post shows how to use BillionGraves GPS Nearby Graves feature to find people who are buried near United States president, Thomas Jefferson. Once they have been found, research can confirm if the nearby graves belong to family members. What if there isn’t a headstone to photograph anymore? BillionGraves is the first to recognize that every gravesite doesn’t have a headstone to photograph. In every case possible, we strive to get a photograph of the headstone. 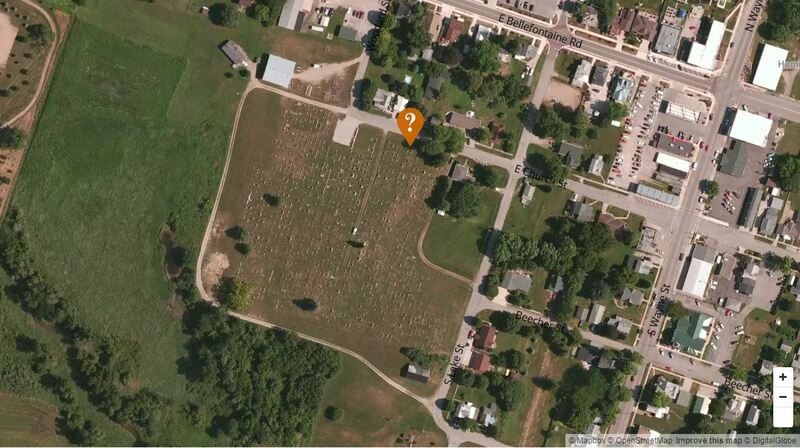 In cases where there isn’t a headstone, we will track the GPS locations of spaces where we know there are burials. We do this by working with the cemetery and other sources to identify the burial location. This makes it possible for the descendants and cemetery to have the stone replaced. Additionally, in situations where it isn’t possible to have a headstone, we work with the cemetery and other genealogical resources to find burial records, death certificates, obituaries, and other supporting records to identify unmarked graves in cemeteries. We do the same for marked graves that may now be illegible. This provides further evidence to support existing marked burials or to preserve the only records remaining for unmarked or damaged graves. Why don’t BillionGraves and Find A Grave just work together? Well, because we aren’t doing the same thing. BillionGraves emphasizes the importance of every headstone having an image and a GPS location. This ensures accuracy in your family tree that follows the Genealogical Proof Standard. Who owns BillionGraves and Find A Grave? BillionGraves is an independently owned company. BillionGraves partners with FamilySearch, My Heritage, FindMyPast and other genealogical companies. Each of these companies has indexes of BillionGraves records. The data has been shared with these partners to help get the genealogical data into the homes of more users. Find A Grave is owned by Ancestry.com. The company was sold to Ancestry.com in 2014 and continues to work under their umbrella. How can understanding the differences between BillionGraves and Find A Grave impact your family tree? To see how the information about BillionGraves and Find A Grave can impact your own family tree, let’s look at an example. Genealogist Anna Young wanted to extend her family tree by finding the gravestone of her great-aunt, Alice Bower. Anna initially turned to Find A Grave to search for Alice’s gravestone. She discovered an entry that said that Alice was buried at the Manor Church of the Brethren Cemetery in Washington County, Maryland. There was even a photo of Alice’s headstone. So Anna took a trip from Utah to Maryland to see the headstone. She also planned to gather additional information about those buried nearby. When Anna arrived at the cemetery in Maryland she began walking the rows of gravestones to find her family members. Eventually, she found some relatives buried there, but no Alice. Anna had traveled 2000 miles to see that headstone. Needless to say, Anna was very disappointed. When she contacted the individual who had uploaded the photo, she never received a response. She later found that the record had been removed altogether from Find A Grave without mention. BillionGraves and Find A Grave have different purposes. The mission of BillionGraves is to provide sourced documented records that genealogists can rely on. It follows the Genealogical Standard of Proof by providing GPS-linked gravestone images as a foundation for additional information. It follows the pattern of providing evidence first. 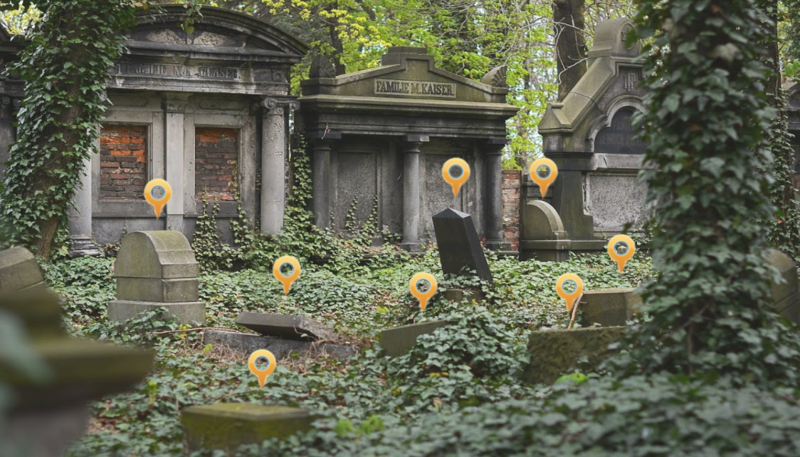 BillionGraves has grown to be the world’s largest GPS-linked cemetery database. Your research matters to us! We want to help your family tree be the best, well-sourced documented tree it can possibly be! P.S. Would you like to take photos with the BillionGraves app? Or lead a group in documenting a cemetery? Then send an email to volunteer@billiongraves.com and we will be happy to assist you!